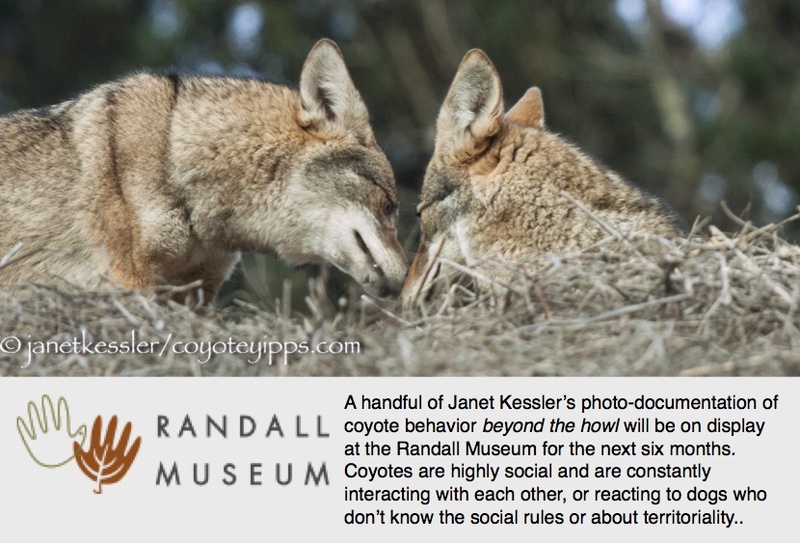 Individuality: Coyote Faces and Personalities: WHO are they? Among other things that I’ve focused on in documenting and investigating coyote behavior and family life, is coyote individuality. This little summary actually is from my February Sausalito exhibit: “Coyotes, Beyond The Howl”, which appeared in the above 5 foot panel. Coyote Faces and Personalities: WHO are they? But beyond these generalizable characteristics, what are individual coyotes really like and how are they identifiable as unique individuals? What their behavior has shown me is that they indeed are very individualistic — they are individuals and should be looked at as such. We should be asking, WHO are they? Using fur and markings to identify coyotes is not very effective. For one thing, different lighting conditions can alter our perceptions. But also, fur changes over time: every year it is shed and along with that shedding, the markings become muted until a new coat grows back. However, each coyote has a very different face and can thereby be distinguished this way. And the distinctions go much deeper than their looks: each coyote has his/her discrete personality, a unique history and their own social situation — each is an individual, and this is what I see. This is one of the reasons they are so fascinating to study and document. What characteristics might make one coyote different from the next? First, family situation is very important, with many behaviors stemming from family roles and interactions: Mom, Dad, pups — or the lack thereof for recently dispersed loners. And each of these roles is carried out a little differently depending on the individuals involved. Personality characteristics also define each coyote: Some are tricksters or teasers, some are more adventuresome, curious, intrepid, shy, bold, bossy, wary, patient, persistent, easy going, tense, care-giving, more or less social or playful. Some are domineering by nature, some are more submissive, and so forth. Some of the traits appear to be ones individual coyotes are born with. Others seem to arise or develop over time, possibly as a reaction to siblings and parents, to repeat situations and environments. Maeve, age 6, is a single mom, acutely aware of her surroundings and totally in-charge of her family — a true alpha — in spite of her very tiny size. She knows every single regular walker and dog in her park and knows which may go after her or her pups — she goes into high-alert when these are around, and keeps her eyes on them. She exhibits double the personality and fun of other coyotes. She’s always out doing things during daylight hours and she wears her feelings on her sleeve, which is why it’s so rewarding to watch her. I tend to think she has a sense of humor about herself. She teases her pups good-naturedly. Silver, age 9, is an incredibly devoted male. He follows his mate around everywhere and wants to be with her, always solicitous and displaying a huge amount of affection. He’s a father who is a harsh disciplinarian with his pups — he’s had six litters so far. He’s the one who is always on the lookout for threats to his den, and on the slightest suspicion of danger, he moves them. As he has aged, he displays less bravado, preferring to hide out — unless his mate is threatened! He’s an alpha by default and often uses brawn to lead. Gum Nut, aged 2, was the guy who always ended up at the bottom in a vie-for-superiority pileup with siblings. He loved to play and get along, had not an ounce of bad will or competitiveness, spent all his time with his sister and would have become her mate if Dad hadn’t kicked him out. He endured being at the bottom of the totem pole in the hopes of staying with Sis. Daily bullying and harassment by Dad (this was the father role at work) finally got to him. One day he was no longer there. He existed for the love of his sister, and for their exuberant play, wrestling, grooming, nuzzles. After he left, I found him in another park where he lived for a while as a transient. I no longer know his whereabout. Chert, age 5, was always the most fearless and adventuresome of her litter. I would find her exploring far afield way before the others did. She’s still very independent, to the point of being aloof, and enjoys going off on her own. She’s affectionate towards her mate, but submissive him, the dominant one. In the past was not a good mother — she fussed minimally over her brood and seemed just to *put up* with motherhood, but Dad filled in for her! This year is different. She’s been minding her brood, possibly because, for the first time, there’s more than just one pup in her litter. Scout, age 3 1/2, was an *only child* though more infant pups may simply not have survived. Suddenly one day, Dad turned on her and forced her to leave. She had a mind of her own and was somewhat of an upstart, which may be the reason she was kicked out fairly early — at 9 months vs. some who don’t leave home until as late as 3 years of age. She found herself an open space where she has survived for over 2 years as a “loner” coyote. After neighbors’ initial alarm and fear of the newcomer, they took a liking to her — too much so — and fed and befriended her. Tossed food from cars and on the side of the road, this little coyote’s life now is in constant danger from cars. Please don’t feed or befriend a coyote — it hurts them! She is spunky and full of fun, but much too uppety — approaching some dogs testingly even when they bark at her ferociously. She loves to play with toys, be they sticks, balls, old shoes or jackets, or even bushes, and she seems to appreciate an audience, judging by her eyeing hers repeatedly to see their response and then continuing. Sonny, aged 1.5, is particularly unique. His twin sister is his opposite: out in front, investigating new situations, not fearful, and imposes dominance on a younger sibling . Sonny, on the other hand always keeps back. He assesses everything visually from afar, and is quick to flee. But if there is trouble, say from a dog, he’s there to help defend. He is peacekeeper among his siblings: if one taunts or threatens another, he steps in and disciplines with a threatening snarl and snout clamp. He does not like dissension. I saw a Ted Talks video recently which emphasized that these are the markers of a true alpha. Bravado, by the way, is not one of the markers. Also, he consoles any of the others who have been heavy handedly disciplined by Mom. Interestingly, he’s buddies with his Dad. Ivan, aged 12, is the oldest living coyote I know. He’s also the largest and the gentlest. He’s the alpha of his family, though his mate often attempts wresting control. This fellow just watches it happen, doesn’t respond, and picks up where he left off. Dispersion for his last son of last year was such a joy to watch. There was always respect and encouragement, never any bullying as I’ve seen in other coyote families. Shortly before this last son took off, I saw Ivan encouraging this youngster to play as an equal with him, his dad. The youngster was overjoyed and so was the dad. It was their last play session together before the youngster left. I’ll always see that session as an encouragement by Ivan, and their mutual acceptance that the next step was departure. This easy-going and caring family ruler, however, is a toughie when it comes to intruder dogs who he would message ferociously — no holds barred!